We've spent years working FOR charities, not just WITH them. We not only design VAT-free charity websites, we're also experts in creating compelling content to go in them. Websites aren't everyone's cup of chari-tea. We aren't your typical digital agency. Commissioning a new website for your charity can feel like a daunting task if you don't do it very often. But we know the charity world inside-out and we pride ourselves on providing friendly, knowledgeable and jargon-free advice and support to our charity clients. We build our websites using WordPress - the world's most popular CMS. It's 'open-source' software so there's no licence fee to pay and you won't be tied into using us or any other agency for the lifetime of your website. Our websites look and work great on computers, tablets and smartphones. They all have easy to use and secure donation forms, fundraising events, blogs and news items built in. When it comes to design and content, we're the experts in knowing what will make your supporters get inspired and get involved. Most of our websites are built using WordPress — the world's most popular and open-source Content Management System (CMS). They're easy for your staff to edit and maintain, but they're locked down so they're secure from hackers and malware. Asking how much a website costs is a bit like asking 'how much does a house cost?'. The answer is of course 'it depends', but most of the bespoke sites we build tend to cost between £4,000 and £15,000. For those on a limited budget we also offer a fixed-price charity website service. Get the free PDF version of our DIY charity digital toolkit when you sign up for our newsletter. Having worked with Jo for the best part of a decade at Comic Relief, I know first-hand just what a highly-skilled, creative copywriter she is. Her knowledge and experience in charity communications makes her an invaluable asset to any charitable organisation. She has a particular flair for turning raw information about complicated social issues into truly compelling copy that speaks to the intended audience with heart and feeling. She’s also ridiculously efficient, reliable and insightful. 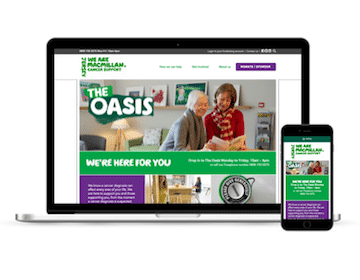 As a small charity we were not simply looking for a new website but for someone with relevant knowledge of the charity sector who could possibly advise and guide us throughout the process. We were lucky to find Ben through an online search! He made things so much easier for us and was able to anticipate our needs, understand our expectations and drive the whole process. On top of that he kept following up after the launch of the website and made sure everything was fine. I can truly say he is not just a competent professional but he is a great person to deal with and most of all, gifted with great patience! He certainly comes highly recommended by us. Last year we decided to update and refresh our old website, from both a visual perspective as well as the updating and re-writing the web content. We found Charity & Biscuits were able to offer a complete service which was a very smooth and pain free process. We initially only wanted them to re-write the web copy, however we then decided we wanted them to re-design the website as well. Dealing with Jo and Ben throughout this process was a ‘breath of fresh air’! They were able to answer my questions, clarify any confusion I had and were able to clearly communicate what needed to be done to get the results we wanted. I would thoroughly recommend Charity & Biscuits if you’re thinking of developing, designing or refreshing your website. They were very helpful and understanding of the needs of a small charity like ours. Been tasked with getting a new website for your charity - but you don't know where to start? Got a website tender that you'd like some agencies to submit a proposal for? Had a bad experience with a traditional web agency, or know someone who has? Want some help translating the your charity's great work into some great website content? Do you know that you want to move or develop your website on an open-source CMS like WordPress? Looking for charity experts who know all about fundraising, donations, GDPR & accessibility?